The 2018 season is set to begin for the Colorado Buffaloes, as they kick off the year with another highly anticipated matchup against in-state rival, Colorado State (0-1). 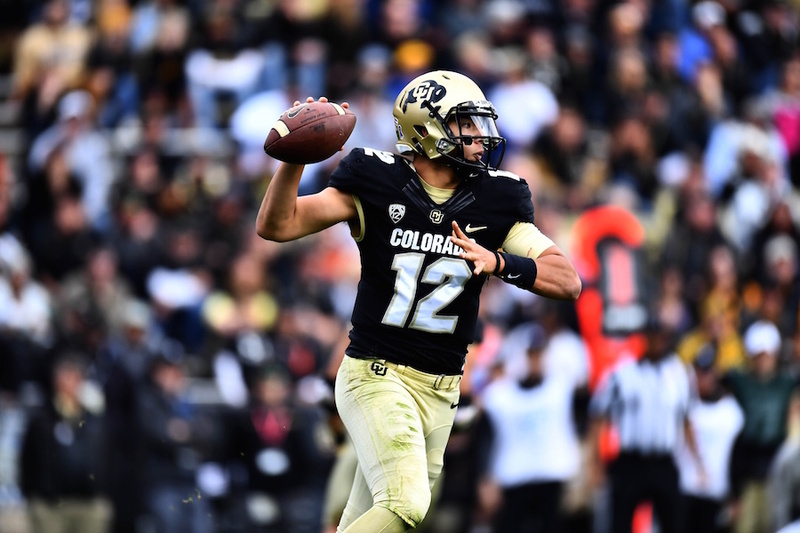 Will the Buffs make it four consecutive wins over the Rams and ultimately have a bounce-back season after a disappointing finish in the Pac-12 in 2017? Or will they have another tough season and finish at the bottom yet again? On Friday, we will have our first real look at 2018 Buffaloes, as the two teams face off in the annual Rocky Mountain Showdown. Here are three things to watch for in Friday’s matchup. Steven Montez enters the year with high expectations as fans expect it to be his best year yet. If he meets or exceeds those expectations, 2018 might end up being his final year in the black and gold, as his arm strength and athleticism will certainly attract the attention of NFL scouts. All of that begins with Friday’s matchup against CSU though. With Phillip Lindsay no longer in the locker room, Montez’s presence as a leader will be paramount to getting the Buffs’ season off to a quick start. Not only is Montez expected to be more of a leader, but he will also be without his top three wide receivers from last year and five other starters from last year’s team. Montez is coming off of a year in which he threw for 2,975 yards and 18 touchdowns, but he struggled mightily with decision making and taking care of the football. He has all of the physical tools to be one of the top quarterbacks in the nation and many are starting to take notice as he picked up multiple preseason watch list honors. Last season certainly did not go as expected for Montez and CU football as a whole, but with added motivation, 2018 could be a big year for the CU offense. On the flipside, it will be all about seeing graduate transfer QB K.J. Carta-Samuels for CSU fans. In the Rams’ season-opening loss, it was Carta-Samuels that almost brought the team back. Colorado State, led by the veteran quarterback, cut turned 30-point deficit into a one possession game late in the fourth quarter against Hawaii. The senior QB threw for a single-game school record of 537 yards and five touchdowns in the loss, but most of it came when it was too late. Despite the big performance through the air, it will be interesting to see how Carta-Samuels performs against a much more stout Colorado defense. Limiting Carta-Samuels’ high-powered passing attack will be the Buffs’ No. 1 priority and offers an area of concern for Colorado’s defense in the Rocky Mountain Showdown. For months, we have speculated about how the Buffs will replace the production of Phillip Lindsay in the backfield. Realistically, it will be tough for anyone to step in that role, as Lindsay is widely viewed as one of the greatest, if not the greatest CU player of the last two decades. Lindsay racked up 3, 7775 yards and scored 36 touchdowns in his four-year career at CU, both of which rank second in CU football history. It will not just be his statistical production that is missed. More than anything, it will be his heart, charisma and leadership that will be difficult to replace. Lindsay was truly a once-in-a-generation type player with the perfect mix of talent and determination. Fortunately for Colorado, they might be able to replace some of that production with Virginia Tech transfer Travon McMillan. In three seasons with Virginia Tech, McMillan rushed for 2,153 yards and the 6’0″ workhorse of a running back seems to have really caught the attention of head coach Mike MacIntyre. It will be a bit different than what fans are used to but will be a player that the fans grow to love. It appears that there will be a running back by committee approach, at least to start as senior Kyle Evans will also be in the fold and we should expect him to make some big plays, but it all comes down to McMillan and he should set the tone early against a Rams defense that gave up aplenty in last week’s loss against Hawaii. Whenever a team loses its top three wide receivers from the previous season, it is usually going to be difficult to replace that amount of production, but the Buffs may just have the talent on the outside to do so without skipping a beat. Bryce Bobo, Shay Fields and Devin Ross were quite the trio, all ranking in the top 10 for total receptions.The three combined for 1,824 yards and 11 touchdowns last season, but I imagine this year’s unit will be able to surpass those numbers. In camp it seems that Montez is building great rapport with his new weapons and that should carry on for the upcoming season. Juwan Winfree will surely play a bigger role in the offense and should turn a few heads this year. As will one of the most reliable pass catchers on the roster in Jay MacIntyre. But the player I am most excited to see in action is Laviska Shenault Jr., who has the talent to take the team by storm. Shenault is a deep threat and should be targeted often, especially against a CSU defense that struggled to defend the pass last week. Hawaii’s QB, Cole McDonald threw for 418 yards against the Rams and had two receivers finish over 120 yards. Montez and the Buffs should have the same type of success Friday night. Who emerges as the top receiver is still to be seen, but, the passing attack is what the Buffaloes will ride this year with as talented a group that the nation will soon see and it starts on Friday in a great traditional rivalry game.